DEV IT has been adjudged as a winner of the ChannelWorld Premier 100 Awards, 2017 by IDG, for the fourth time. Once again, we emerged as a winner among hundreds of worthy nominations that the jury had received from across India. After a stringent evaluation process, a jury comprising senior and experienced leaders screened all entries and announced the winners. DEV IT was recognized as “The Futurists 100″. We were honoured as an organization that implemented innovative, agile and transformative moves to transform the technology blueprint and business outlook to accelerate the digital agenda for enterprise customers. The award ceremony was held at ITC Maratha, Mumbai on May 19, 2017. The ChannelWorld Premier 100 Awards felicitates India’s leading Enterprise IT Channel partners for their role in growing the IT business. The recognition is for demonstrating exemplary business practices in a challenging and competitive business environment. This award is an important milestone for us and reaffirms our commitment towards delivering end-to-end IT services, constant innovation and digital transformation to our global clientele. 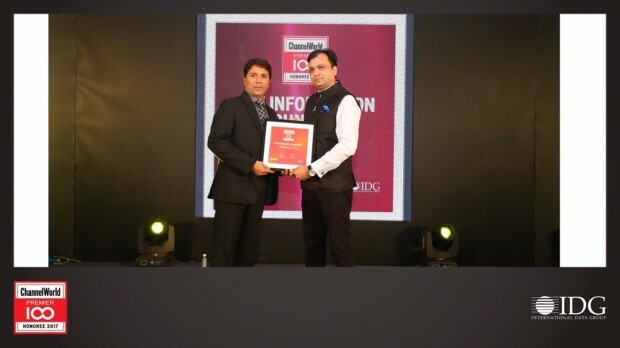 Mr. Vishal Vasu – CTO, Dev Information Technology Ltd. received the award.